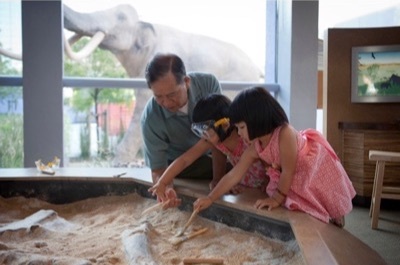 Children's Discovery Museum of San Jose is a place of learning not only for children and families. For more than two decades, the museum has been a living laboratory for developmental psychologist Maureen Callanan, whose work focuses on understanding how children learn to think about the world around them. "Unlike what the field of developmental psychology assumed for years, children don't all just think one way," said Callanan, a professor of psychology at UC Santa Cruz. "Children are learning different ways to think depending on the family, community, and culture they're growing up in." 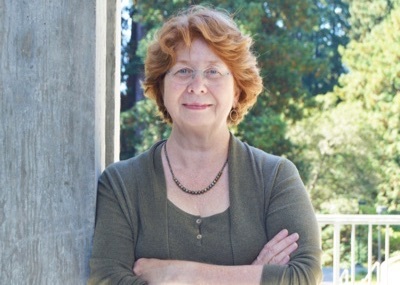 Callanan's research focuses on the "why" questions children ask and how children learn to explain causes and effects, and she is committed to learning about children in the social and cultural contexts where they grow up. That's what makes Children's Discovery Museum a perfect partner. Children from diverse racial, cultural, and linguistic backgrounds visit the museum, and museum administrators are eager to team up with Callanan to learn more about how the learning process unfolds in children. Callanan just published the results of a recent study based on the museum's Mammoth Discovery! exhibit. In the current issue of Child Development, in a special section devoted to research in the "real world," Callanan reports that the ways parents talked with their children about the exhibit was linked to the level of children's engagement—in ways that may be surprising. Explaining science to children isn't as engaging as making connections to a child's personal experience, said Callanan. "A lot of parents made the connection with the movie Ice Age, asking their children if they remembered the mammoth in Ice Age," said Callanan. "Another parent pointed out that the mammoth fossils in the exhibit were discovered 'near where Daddy works.' "
Engagement is key to learning, and the children whose parents made those types of connections were more involved with the exhibit, as measured by the questions they asked and the observations they shared on their own. Callanan's findings are based on observation, and she is careful to clarify that her results establish correlation not cause. Still, this study, coauthored with graduate student Claudia Castañeda, research associate Megan Luce of Stanford University, and Jennifer Martin, director of education and programs at Children's Discovery Museum of San Jose, adds to what Callanan has learned about child development over more than 20 years. "Parents often worry that they don't understand the science, and museum exhibit designers worry about that, too—that parents might give children the wrong information," said Callanan. "But giving children scientific explanations isn't necessarily the best way to support children’s engagement with ideas." Callanan notes that parents are uniquely qualified to support their children's cognitive development. "Everyday conversations are the building blocks of children's learning," she said. "Parents know their kids best. They can make those meaningful connections. When parents do what comes naturally, that tends to be the best framework for children's learning." Callanan and her research team observe children in the "real world" because it is more natural than a laboratory setting. Children's Discovery Museum in downtown San Jose attracts a diverse audience—although visitors tend to have relatively high incomes and education—and the "content-rich" environment is perfect for eliciting "why" questions. This work is more timely than ever, as scientific literacy in the United States has plummeted to alarming levels. There is broad consensus that families and educators need to foster children's interest in science and technology—so-called STEM fields—at a young age, but there is far less agreement about the best way to do that. Museums and other places of "informal learning" enrich insights gleaned from school classrooms. "My goal is to understand more about how parents' strategies for interacting with their children in museums might support children's engagement with science," said Callanan, who has observed tremendous diversity in the ways parents interact with their children around science. "For some children, talking about science in school connects with their everyday experience, but for others, it doesn't," she said. As a researcher, Callanan is interested in the different habits of thinking and talking that develop in different families. For example, giving evidence for a belief is a natural part of conversation in some families but not others, she said, emphasizing that these habits don’t necessarily correlate with years of education or science expertise. Callanan recalls an earlier study in which a father who was an auto mechanic effortlessly incorporated logic and evidence into a conversation with his young child. "Parents who enjoy thinking and mulling things over—in psychology, we call this personality trait the 'need for cognition'—are more likely to use certain kinds of talk with their children, and those are the ways of thinking in conversation that the children grow up with," she said. "There's no 'right way' to talk with children, just like there's no one way that all children develop." However, understanding variation in families’ conversational habits gives educators more information about how to introduce STEM topics to young children. For museum educators, Callanan's findings have sometimes provided a road map to improve an exhibit. Several years ago, Callanan's team observed strong gender differences in how much time parents and caregivers spent explaining exhibits to boys and girls—with boys getting the lion's share of the explanation. The museum's designers applied what they learned to the development of their next exhibit, which featured a female protagonist. That gave parents the idea that these activities were interesting for girls as well as boys—and there was no longer a gender difference. Another recent study conducted with graduate student Graciela Solis found that parents of Mexican heritage who had not completed high school talked with their children in ways that appeared to foster greater engagement than did parents of Mexican heritage who had earned at least a high-school diploma. "They paid more attention to the evidence and were more willing to say when they were uncertain about what they were observing." Callanan explained. "Their children also asked different questions, more conceptual questions about why things were happening and what would happen next." "We can't assume low-income children, or children whose parents had less formal education, are at risk," she said. "When we look at what those parents do naturally in conversation, their children might be at an advantage." As the editors of the special section of Child Development write, the field of developmental psychology remains "largely defined through WEIRD populations: Western, Educated, Industrialized, Rich, and Democratic." The challenge of broadening the scope of what we know by studying all the world's children in "the messiness of the real world" must be met, they write. "Too often, developmental psychologists describe culturally specific findings as if they were universal traits," she said. "Understanding and appreciating the diverse ways families from a range of cultures engage in conversations is part of getting a bigger, more accurate, picture of how children learn."